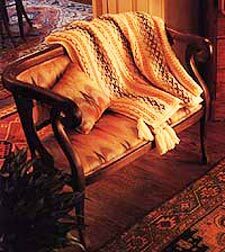 Crochet is combined with Swedish embroidery in this stylish afghan. The textured Moss stitch is the perfect background for the Swedish weaving technique. Approximately 52" x 67 ". 4 Ply Knitting Worsted; 60 ozs. Off White (A); 7 ozs. Garden Pink (B); 3.5 ozs. Conch Shell (C); 7 ozs. Light Blue (D); 3.5 ozs. Dark Blue (E). Size K crochet hook, or size to obtain given gauge. Tapestry needle for weaving. Moss Stitch: 3 stitches = 1"; 7 rows = 2". Row 1: Right side. 1 Single crochet in each stitch. Chain 2, turn. Row 2: Chain 2 on turn is always counted as first hdc, * sl st in next st, 1 hdc in next stitch; repeat from * across, end with a sl st in the last st. Note: Each hdc forms a loop on the right side of work. Chain 1, turn. Row 3: 1 Sc in each hdc and each sl st. Chain 1, turn. Row 4: Sl st in first stitch, 1 hdc in next stitch, * sl st in next stitch, hdc in next stitch; repeat from * across. Chain 1, turn. Repeat these 4 rows for Moss stitch. Row 1: Sc in 2nd chain from hook, * sc in next chain; repeat from * across - 198 stitches. Note: On following pattern repeats work Row 1 as given in pattern for Moss Stitch. Chain 1, turn. Row 2: From front work 1 sc around post of each stitch (insert hook in space before stitch, bring hook across back of stitch and out in space after stitch, draw up a loop and work off the 2 loops as a sc), end sc in end stitch. Chain 1, turn. Note: Row 2 forms a ridge on the right side of work. Row 3: Sc in each sc. Chain 2, turn. Row 4: Work Row 2 of Moss Stitch. Row 5: Sc in each stitch. Chain 1, turn. Row 6: Repeat Row 2 forming a ridge on the right side of work. Chain 1, turn. ** Begin Moss Stitch, repeating Rows 1 through 4 for a total of 30 rows. Repeat Rows 1 through 6 of beginning. Repeat from ** until there are 5 panels of Moss Stitch and 6 panels as the first 6 rows. Fasten off. Note: This afghan has been worked in the length, from side to side. With a long double strand and tapestry needle, work Swedish Weaving Pattern, following diagram. When weaving, go under bar as indicated plus the small stitch underneath so strand is firmly anchored. Work 3 rows even in sc, making sure work is flat. Last row: With right side facing, working backwards from left to right, sc in each stitch. Fasten off. Make 4. Cut 40 strands A, 12" long. Place a length of yarn in center and fold the 40 strands in half. Knot length of yarn securely. With a 2nd length of yarn wrap several times around all strands 1" from the fold to form a head. Make sure it is tied tightly and secured. Trim ends. Fasten 1 Tassel to each corner as shown. See "How To Make a Tassel" at the bottom of the "Crochet Trellis Afghan" project page for more.